The Hitachi P18DSL Cordless Planer uses high capacity 5.0Ah Li-Ion batteries, for a high no load speed that provides a fine finish. It has a maximum cutting depth of 2mm for quick stock removal. The built-in blade stand prevents damage to blades or worktop, prolonging tool life. Fitted with a soft-grip handle for increased user comfort. Remaining battery life indicator helps to increase work performance and productivity. Batteries are fully charged in 75 minutes. 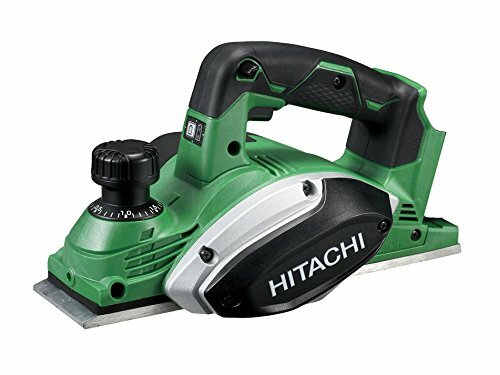 Specifications: No Load Speed: 16,000/min.Cutting Width: 82mm.Max Cutting Depth: 2mm.Maximum Rebate: 9mm.Overall Length: 332mm.Weight: 3.3kg.Hitachi P18DSL/J4 Cordless Planer 18 Volt Bare Unit. No batteries or charger supplied. Comes with side fence, blade setting gauge and a wrench.